Carlos Melo, a principal of the Melo Group, left Buenos Aires for Miami 18 years ago in search of security and stability. 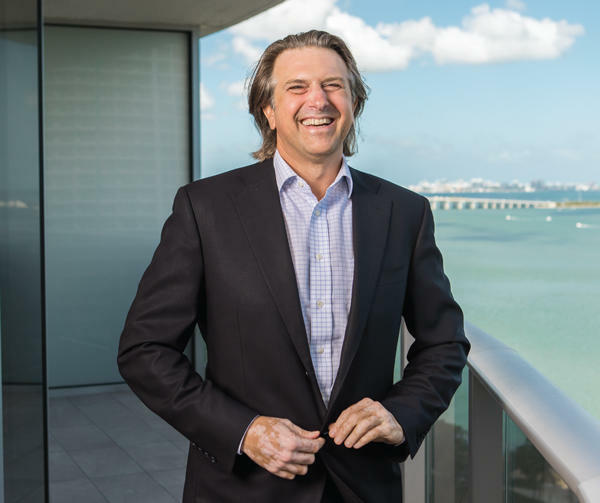 Quickly thereafter, he and his family members found development opportunities in Miami’s then-downtrodden Edgewater neighborhood. Since then, Melo has been involved in building three condo towers and 13 rental buildings in Miami, with 4,896 units completed or under construction. Currently, four projects are in various stages of development: Art Plaza will open with 667 apartments in May, Miami Plaza recently broke ground and will have 437 rental units, Downtown 5th is in the approval process with 1,040 planned apartments, and an as-yet-unnamed two-tower condominium project — on land assembled over eight years at 24th Street and Biscayne Bay — is yet to seek approvals, in anticipation of the next cycle. There’s no end in sight for Melo, whose family (father Jose Luis, 82; brother Martin, 41; and sister Laura, 52) not only works together, but also lives in the same Miami Beach condo tower, shares a car ride to the office and even returns home for lunch. The Real Deal sat down with Melo in a model unit at the recently completed Aria on the Bay condo tower in Edgewater. The interview has been edited and condensed for clarity. What was your first job? Working with my father on construction sites. I can say that I really started working when I was 17. I was in charge of something at a construction site for a high-rise condominium. We never did rentals in Argentina, only condominiums. My father started the company 54 years ago in Argentina. He did around 5,000 condos. When did you come to Miami and why? We decided to move to Miami in 2001. The situation wasn’t very good. It wasn’t due to economic problems. It was more for security and stability. We saw that there was an opportunity here in Miami. The language was easy for us, and the way people live here is much easier for us. How did your family start in real estate here? I came first. I was here a couple of weeks. After that, my father came here for a couple of weeks and he saw the first piece of land at 22nd Street and the bay. This neighborhood was very different than it is today. It was a bad neighborhood. Everybody said, “Why did you buy there?” We didn’t know the past. We saw the future — the location, the views, the proximity to the good areas — and we saw that the people sleeping on the street you can remove, but you can’t remove the good place next to the water. We always try to do the same thing: to see locations that have potential and exploit this potential in these empty areas. Since you built only condos in Argentina, why was your first Miami project a rental building? We thought it was difficult to sell a place that is not ready yet. It’s difficult to show 100 or 600 people that they have to buy there when nothing exists. The first we did was a rental: 22 Biscayne Bay. It was a small building with 100-something units. Why have you switched to rentals lately? The condominium depends on where it is located, the timing, who is your buyer, who is your target. You have to design differently. We started with rentals, and now we are doing rentals again. When we open Art Plaza in May, we are going to reach 3,400 units that we built and are renting. Square Station, which we opened in June 2018, was 710 units, and it was completed in 18 months. We filled it with tenants in four months. It was 30 to 40 tenants per week. What is your strategy for getting tenants? The strategy is to have a good product with a good location and a good price. That’s the key. I think that we have lower prices than the competition. The reason is because we have everything integrated in our business. We are the developers. We don’t have outside investors. We only use local banks. We are the general contractors, too, and we have the management company that manages the buildings. All this vertical integration gives us some advantage to other companies that have to split their business. How do you and your family members divide responsibilities for the business? The head is my father, Jose Luis, and he’s 82. After that is my brother and me. My brother, Martin, is more in financing, and I am more in architecture, development and construction. My sister, Laura, is the oldest. She works in the management office. We all live in the same [condo] building — my father, my brother and me. We ride the same car in the morning. We go to lunch at home together, and in the afternoon we [return] in two cars because I come back with Martin, and my father comes half an hour before us. What else do you have planned? We have a nice piece of land for two towers, 60 floors over the bay, at 24th [Street]. We bought more than 70 different properties. We bought condominiums one by one, we bought small rental buildings, we bought houses [and] foreclosures. In the last eight years, [we] put all of this together, and now it is complete. It will be two towers, 60 floors, 800 units, condominiums, no name yet. We don’t know yet when we will start construction. When the market is ready. Are you still buying sites? If something appears that is attractive for us, we like to buy. If you are in this business, you are all the time looking. Sometimes it makes sense and you buy, sometimes it doesn’t make sense and you don’t buy. It’s difficult to find something in a few months. You need to start looking and searching and know the city where you are, where people want to live, who is your target. Where did you meet your wife? We met when we were 18. We started dating at 20, we married at 28, and we are still happily married. We met with a group of friends in common. She is an artist. What is the secret to a happy marriage? To choose the correct person. What is the best advice you have received? From my father, all the time. There are many: To be honest. To be a hard worker. Don’t think about the money, think of what you are doing, do it well and the rest will come later. It’s not about the number, it’s about what you did.